A lot has happened since I last updated my blog. I know, I know, writers always say that, don’t we? There’s always something happening, like another cross-country move, a new job, a bunch of new classes to prepare, a few weeks in South Africa, that scholarly article I swore I’d finally revise…. (I’m only kidding–these are all very important somethings). What I mean, I think, is that I’ve spent so much of my time pouring all of my energies into my other life this past year – the Dr. Winet life – that I promised myself I’d do one thing for me, Kristin, humble writer and hopeful photographer, this summer. Why Portugal? Well, other than its close proximity to the first place I ever traveled when I was 21 years old and the country that stole my heart almost immediately (hi, Spain! ), Portugal has always, always, always been on my lifelong hope-to-travel-to-someday list. It’s on there with places like Cuba, Egypt, Japan, and Nepal, places I’ve never been but long, someday, to see with my very own eyes. (And, actually, there are a lot of places on that list, let me tell you). But to be perfectly honest, I don’t know exactly why Portugal. As in, what exactly has enraptured me. I can pinpoint why I want to visit a place like Cuba: it was off-limits for so long! Or Egypt: those pyramids! Or Japan: that sushi! Or Nepal: those mountains! And yet, Portugal has always been on that list, too, so much so that when I initiated the idea of doing another trip with Viking River Cruises and they asked me where I’d like to go and I immediately said to myself, “Oh, that’s easy – Portugal!”, I realized that I had some work to do. What was it about Portugal? In European terms, Portugal is, well…it’s kind of remote. It’s not Mediterranean, although it seems like it should be. It’s not connected to five other little countries like so many other countries in Europe, although it really isn’t that far from the rest of the continent. It’s not Spanish-speaking, although I suspect I’ll be able to fumble my way through at least 45% of the time (Ryan is gunning for 60% since he maintains, erroneously, that Portuguese and Spanish are basically dialects of each other…we’ll see how that pans out). The more I thought about it, the more I realized that the reason this little country has always held my attention is because I’m simply curious about it. I’m curious because although I’m familiar with it, there’s so much I just don’t know about it. It’s always been just out of reach. For instance: I am fascinated by the language of Portuguese, but can’t really speak it. I know people probably eat a lot of sausages and seafood there, but I don’t know that much about the cuisine. I have heard fado music through its descendant the bossa nova, but I’ve never actually heard the guitarra in its original form. I can recite some of the history of the Iberian Peninsula (thanks to my undergraduate degree in Spanish Literature), but I don’t know a whole lot about contemporary Portugal or its politics or recent history. I’ve read a ton of poetry and plays from the Iberian Middle Ages, but never a Portuguese author. See what I mean? It’s kind of like this place that I just never quite got to–but not because I didn’t want to; more like because I was never close enough to pop over to it but always kept it on the list because I knew I’d get there sometime. And here we are, packing up for our Portugal’s Rivers of Gold trip. I’m taking Ryan with me (oh, the perks of him being married to a travel writer, am I right?!) and we leave tomorrow morning for our journey to Lisbon. Once we’re there, we’ll spend two nights at the Hotel Tivoli Lisbon (it’s a gorgeous 5-star resort in the heart of Lisbon…I can’t wait to slip into the fluffy terrycloth bathrobes and slippers that I am sure await me there! ), and then we’ll hit the Duoro for our week-long cruise. And then we get back and we’ll have one day to recover from the jet lag before school starts again. And that’s just how our life goes, crazy as it is. In case you’re considering a trip to Portugal, here’s the scoop on where we’ll be headed and what my plans are while I’m there. Keep in mind that I’ve crammed in a couple of side trips/journo stuff for my own writing (you wouldn’t necessarily be trailing along on a walking food tour just so you could try and find the best pastel de nata chef or chasing after giant paper mache dolls in a parade you heard is going to be happening in a small town you’re cruising through while you’re there….well, you might be, in which case, let me know!). After our first night, we’ll get up early and start with a half-day tour of Lisbon. From what I’ve read online, we’ll begin at the super cute Belém district and check out the Jerónimos Monastery, one of the most important and breathtaking examples of Portuguese late Gothic architecture (it’s also a UNESCO World Heritage Site!). Then, we’re heading off on a walking tour through the Alfama District where we’ll get some history lessons along the way. The next day, the only thing we have scheduled is a walking food tour called “A Taste of Lisbon.” We’ll walk over to what our guide is calling the “working-class district” of Graca and pop in to no less than four local restaurants, pubs, and bakeries. What I love about walking food tours is that you can really experience two things at once: the rhythm of a city by foot and its culinary wonders, one after the other. This tour is where I hope to talk to someone about making the pastel de nata, a fancy egg tart that’s supposedly creamy inside and crunchy outside. We’ll see what I find! On Day 3, we board the ship and start the journey to Porto! As we start the cruise, we have a stop at an old university town on the way – Coimbra – where we’ll get to check out Portugal’s oldest university (it’s been open for SEVEN centuries….I’m serious). As a teacher, I’m really excited about this, and I’m especially curious to see if I can pop in and see anyone in the English department while we’re there. Also, there’s something I absolutely love about visiting other campuses in other countries–it’s one of my very favorite things to do when I’m traveling. The next day, we’re doing a city tour of Porto itself, which, in addition to being known as the home of port wine, is also an adorable riverside community whose historic center is (you guessed it) also a UNESCO World Heritage Site. We’re planning on visiting a local port wine–making facility and then heading out for lunch. That afternoon, we’ve signed up for an excursion to the nation’s first capital, Guimarães, which is (is there a pattern here yet?) yet another UNESCO World Heritage Site. Guimarães has a medieval quarter with narrow streets, a main square and palaces and monasteries dating back to the 10th century. In the 12th century, it was Portugal’s first capital and home to its first king, Afonso Henriques. It should be spectacular. Today, we cruise through Regua and Pinhao, two riverside cities along the Duoro River. Along the way, we’re going to stop at Mateus Palace, a baroque palace was the home of the last count of Vila Real. Then, the plan is to visit one of the area’s port wine–making shops (can’t complain about that, am I right?!). Everyone also gets to do a private tour of the vineyards. Also: Did I mention that Ryan and I figured out that we are going to be in Regua during the annual Day of Assumption? This means that we are going to be there on exactly the same day as the gigantones parade, where people march in the streets with giant paper mache dolls. I am SO excited to catch this! Another sailing day! Today, we keep going east. Along the way, we pass through Portugal’s most dramatic cliffs, terraced vineyards, and bridges. We’ll arrive at Barca d’Alva, not far from the Spanish border, in the mid-afternoon. After lunch, we get off the ship to take a tour to Castelo Rodrigo, which is located 2,200 feet above sea level and is purportedly surrounded by lush almond trees. While we’re there, we also plan to stop at historic Sinagoga Street, the part of the city where Jewish refugees escaped and made their new home during the Spanish Inquisition. If you know me at all, need I say more about this day? We’re crossing over into Spain!!!! (And yes, in case you’re wondering, Salamanca is another UNESCO World Heritage Site). I have always, always wanted to visit this city, not only because it hosts a huge population of international students and is home to Spain’s oldest college, but also because it’s literally called La Dorada, or, The Golden City, because of its sandstone buildings that seem to glow in the sunlight. During the day, we have free time to set off and explore. I’ve already told Ryan: we’re heading to the university and spending the afternoon at a cafe. That’s all I really want to do–just sit, and be. You don’t get to do that a lot when you hit up a new city every day. This morning, we sail west along the Douro back to Porto, and along the way, we’ll pass some of the area’s quintas (vineyards). We make a stop in the little village of Favaios, where we will visit one of the last traditional bakeries in the Douro River Valley. We get to take a tour of the kitchen and taste freshly-made loaves straight from the oven. For lunch, we’re going to Quinta da Avessada, a centuries-old winery in the heart of the Douro Wine District (yep, another UNESCO World Heritage Site), and we get to try some local varieties of port, such as moscatel. I’m seeing two trends here: a lot of wine, and a lot of really old places. Days 9 and 10 are the perfect ending: Day 9 is a visit to Lamego, a small town known for its baroque sanctuary and which is still a pilgrimage site for many Catholics today. That evening, we have a lovely farewell dinner, prepared by Viking, to send us on our way. All photographs from Flickr’s Creative Commons. I thank them for their generosity and I hope my photos turn out just as beautifully! I’m excited to be traveling to Portugal and Spain with Viking River Cruises on their 2017 River of Gold tour from Lisbon to Porto. Try it: Tell the next five people you meet that you’re going to be spending two weeks in Eastern Europe this summer and see what they say. You’ll probably hear that Budapest is supposed to be nice. Or that coastal Croatia is just as beautiful as its other Mediterranean neighborhoods and still super cheap. You’ll probably hear some jokes about goulash. Yeah…that’s exactly why I’m going to Eastern Europe. Last year, I whetted my appetite for the post-Soviet world, spending two wonderful weeks exploring Russia with my mom and getting to know a part of the world that, for a long time, had been completely shrouded in mystery to me. It was exhilarating. During those two weeks, my mom and I discovered how onion domes are made, how devoted to the arts and literature Russians really are, and how complicated the everyday lives are for people who live, day in and day out, under Vladimir Putin’s rule. We saw the commingling of Communist-era blocs—homes still owned and lived in by the families who were given free housing back in the 70s—and we saw the intense contrast between that world and the elaborate palaces, cathedrals, and summer homes of the Romanovs. We visited the island of Kizhi and witnessed a cathedral that was built in the 1700s completely out of interlocking wood pieces –no nails or glue of any kind. We sat outside at midnight under the large, low sun and imagined what it must be like to try and sleep during Russia’s white nights if you don’t have pitch-black curtains. We took a little boat down the canals of St. Petersburg, and we wandered the cosmopolitan streets of Moscow. More than anything else, our trip broke, reinforced, and fractured every stereotype I had about Russia (except the whole “polar bears on the streets of Moscow” thing …sadly it was 70 degrees Fahrenheit and sunny). Just like the United States, Russians, too, find themselves in a globally powerful country that politically doesn’t always jive with their interests, and most of them want to be heard, understood, and respected. I’ve been thinking about it all year. With every article I wrote about my trip, I realized that I wanted to know more—I wanted to learn more about what life was (and is) like in the countries and societies that were also affected by Russia and by Communist rule. I wanted to meet more people, hear their stories, and better understand a part of history that is still so elusive to me. Basically, I wanted to see more of Eastern Europe. And what better way than to sail with Viking again? One of the best parts about taking trips with Viking is that you really can cover a good bit of ground—and you’re surrounded by experts who live and work in the countries you’re visiting. After Russia, I felt like I had such a deeper and more profound understanding of the culture there because I could ask questions and talk to our tour guides about their own experiences. Plus, they held a few “round-table” sessions where we could come and ask questions about education, housing, politics, and anything else that was on our minds. People did come, and they asked hard questions. The tour guides were ready for all of them and answered each query honestly and openly. The 11-day cruise covers 5 countries, including Romania, Bulgaria, Serbia, Croatia, and Hungary. It offers a number of offshore excursions, too, that sound like they would really give me a diversity of perspectives on life in both the city and countryside. I signed up right away. Then, I went to the store, bought a card, scribbled a note to my husband about how much I wanted to celebrate the beginning of our new chapter together (more on our spectacularly crappy professional year later), and I invited him to join me. He opened the card and looked at me in the way he always looks at me when I’ve concocted up a new way for us to travel together. He could see that my eyes were sparkling in a mix of anticipation and excitement. So here we are. We leave tomorrow morning for our long voyage to Hungary. Once we’re there, we’ll spend a few days at the Radisson Blu Hotel Bucharest (sounds swanky…I hope they have those fluffy terrycloth bathrobes and slippers! ), and then we’ll hit the Danube for our cruise. In case you’re considering a trip to Eastern Europe, here’s the scoop on where we’ll be headed and what my plans are while I’m there. Keep in mind that I’ve crammed in a couple of side trips/journo stuff for my own writing (you wouldn’t necessarily be interviewing a Magyar horseman, investigating the history of paprika as a colonial food, or visiting Memento Park to see gigantic Soviet-Era statues….well, you might be, in which case, let me know!). Here’s the lowdown on where we’re headed. The first leg of our journey will be two days in Bucharest, Romania’s cultural capital. From what I can tell, Bucharest seems to be relatively underrated as a tourist destination, which isn’t necessarily a bad thing. In our first two days, we’re going to check out the French-style boulevards, public gardens (I have heard marvelous things about the Bucharest Botanical Gardens), and visit a few of the city’s palaces. We’ll be spending an afternoon in the historic Lipscani district, which, from what I can tell, is a European beauty—full of cobblestone streets, boutique inns, art galleries, and shops and restaurants. We’ll also be checking out a few of Bucharest’s tourist “hot spots:” the monastery where Prince Vlad is rumored to have been buried, and the Palace of the Parliament, which is said to contain over 3,000 rooms. Now that’s a house. Our first stop will be the town of Russe, Bulgaria, otherwise known as Eastern Europe’s “Little Vienna” for its historically critical port, mash-up of neo-baroque, neo-rococo, and Renaissance architecture, and its relaxed, European waterfront lifestyle. We’ve signed up for a day trip to Veliko Tarnovo and Arbanasi, two medieval towns renowned for their handicrafts and local artist colonies. We’ll have coffee at a rooftop café in Veliko Tarnovo, overlooking the Old Town, explore Samovodska Charshia (one of the art districts) and visit castle ruins. Then, we’ll head to Arbanasi, where we’ll have lunch and meet with a merchant who makes products out of the essence of roses. I’m not sure we’ll have time for the Russe City Walking Tour, but if we do, it will take us to the old city center and to a couple of museums, including the Museum of History (which houses over 140,000 artifacts—I can’t to dig into the archives on some of these objects!) and the Ethnographic Museum, which houses objects and artifacts related to people’s everyday lives in historical Bulgaria. The next day, we’re planning on heading to the Belogradchik Rocks, a trip which will no doubt inspire the archaelogist inside me. The Rocks are not only a geological wonder, the result of millennia of erosion, freezing, and weathering, but they are also home to the Ottoman-built Belogradchik Fortress—a maze of rooms built into the cliffs. Today, I think we’re just sailing through the Iron Gate, an area renowned as one of Europe’s most stunning natural gorges. We’ll see the Carpathian Mountains on one side and the Balkan Mountains on the other. Today will be devoted to exploring Belgrade, described by Lonely Planet as “outspoken, adventurous, proud, and audacious” (sounds a lot like the kind of person I’d want to hang out with) with a “gritty exuberance” (where do they find these adjectives?!). We’re planning on taking a city tour and then hopefully catching at least a happy hour. I mean, if we’re going to be in one of the world’s hottest places for nightlife, we have to at least have a Serbian cocktail, right? Now, it’s really too bad that I can’t skip away for a day or two and head to the Mediterranean coast of Croatia, but I’m actually kind of excited about where we are going: Osijek. I don’t know exactly what this excursion will entail, but we’re planning on visiting a family and then walking along the promenade on the Drava River. I’m imagining a relatively relaxing day in this small Croatian village—which is perfectly fine with me. To be honest, Hungary is one of those countries I’ve wanted to visit since I was a little girl, and I don’t know exactly why. Maybe because I always laughed about the name—how could a country share a name with my language’s word for wanting to eat? !—but also because I’ve always heard such magnificent things about Budapest, the country’s capital. Our journey will end here, in Hungary, a place I am so excited to meet. We’ll begin our three days in Kalocsa, a place I’ve learned is not only where the majority of the world’s paprika is harvested, but also where the Hungarian Puszta, a community devoted to preserving a non-motorized world and who get around on horseback, live, work, and play. I’m hoping to interview one of the horsemen before or after their show (which is rumored to be both acrobatic, artful, and death-defying) but I’m not sure we’ll be able to communicate with each other. I’ll have my Google Translate app with me, but it’s not always so easy to do an interview when you’re both typing into a smartphone what you’d really like to say. But we’ll see—I really want to learn more about their attitudes against motorized transport and modernity. Our last two days will be in the lovely city of Budapest. We’ll hop on a city tour one day and head to a Roman thermal bath, but the rest of our time in Hungary will be spent running around trying to fit in all the places I’m writing about. Though I don’t know exactly how I’ll get there yet, I’m planning on finding Memento Park, where, according to their delightful website, the “ghosts of Communist Dictatorship” live. The park is basically an open-air museum where, after the fall of Communism, people dumped a whole bunch of gigantic Communist statues. I can’t wait to see this place. I’m also interested in visiting the Central Hall Market, which I’ve heard from some other travel writing friends is a photographer’s dream. Because of my nerdy interest in public spaces and rhetoric in the world, I’m also trying to fit in a trip to the For Sale Pub, a bar that encourages drinkers to leave their words on the walls, floors, chairs, and ceilings. They can leave their “personal advertisements” anywhere they like. It sounds magical, and weird, and the perfect place for me. With that, then, I’m going to start packing. Typing these words has started making my heart flutter just a little bit faster…oh, travel, how you ignite my soul, time and time again. If you’ve been to Eastern Europe and have any tips for me, please leave a note for me here or get in touch with me on social media! I can’t wait to share this journey. I’m excited to be traveling to Eastern Europe with Viking River Cruises on their 2016 Passage to Eastern Europe cruise from Bucharest to Budapest. It’s been a weird year, to say the least. My family has this ongoing mantra that 2016 better be our year of calm, as 2015 was unusually unlucky in some ways and unusually wonderful in others. We had the usual suspects so typical of difficulties in a family life: my mom’s unexpected bronchitis that landed her in the hospital for a week and resulted in her missing my graduation…and then her persistent cancer coming back for the fourth time in eight years just a month after we returned from Russia. My husband Ryan’s uncle’s unexpected death. My sister’s toxic job environment that nearly and almost literally unraveled her. My 92-year-old grandma’s quickening dementia. Car accidents, hospital visits, decisions that became missteps. Things like that. We’ve survived them all, but I have to say, health and wellness can be damn tiring. We had beautiful moments, too, of course. For one thing, I just returned from 10 days in Atlanta for the holidays, where my family and I crammed our week full of get-togethers, long walks, good restaurants, day trips, and late-night conversations–all the accoutrements connected with quality family moments. I reconnected with the stark beauty of the Appalachian forests. I breathed in the crisp, cool air in the early mornings and looked for abandoned birds’ nests in the trees that had lost their leaves. These are beautiful moments. The year also marked a lot of changes for me. For one thing, my life went into upheaval in May when I finally finished the dissertation on feminist approaches to digital travel writing that I’d been writing for the past two years. Though it was one of the proudest moments of my life–nearly 300 pages of well-researched, painstakingly revised discourse on my favorite topic–it also meant that a huge stage, a transformative, difficult, and beautiful stage, of my life was over. That stage where, although I was poor as dirt and living off $15,000 a year as a graduate student, I finally had to face the hard reality that the degree I’d been working on for five years didn’t have a resulting job for me in our sweet desert home in Tucson. That if I wanted to put my degree into practice, it meant moving away. It meant that Ryan would have to leave his student job as a writer for the President’s Office and bring his dissertation along with him, wherever we went. It meant I’d take a job that would hopefully lead to professional fulfillment and spiritual growth and that would also still afford me the time to travel and to pepper my year with the occasional press trip or international voyage. It meant facing the reality that I had to do things like sign up for health insurance and a retirement plan for the first time in my adult life. As I sit here today, in front of my computer screen, just three blocks from the beach (something I thought would bring me a permanent sense of happiness but which, in fact, has been a mere backdrop to the difficulties we’ve had here so far), I can’t help but feel a little bit cynical. I miss our desert home more than I ever thought I possibly could: the striking sunsets, the walks Ryan and I would take around our neighborhood as we learned to identify the strange plants of the Sonoran Desert, the mountainous hikes we took so often and their surprising streams and unusual flowering cacti, the community of writers I’d come to see as family (and still do! ), the dear friends we had to leave behind, the students who worked diligently with our nonprofit community partners and the difference I felt I was making by bridging writing and advocacy work. By August, when we’d packed up our house on the dreams of a good life in California, I still felt unsure that moving was what I wanted. Today, on December 29th, five months after we left, I still feel that way. But that’s for another story for another time. New writing topics, too, entered into my life: I wrote about Rasputin’s man parts, which are supposedly preserved in an itty-bitty erotica museum in the middle of downtown St. Petersburg (verdict’s still out on whether or not it’s a horse organ or the poor man’s 11-inch member, but still.) The piece was picked up by Jezebel Magazine, which still strikes me as unbelievable but amazingly awesome. I also wrote about a museum of still-functional Soviet-Era arcade games and the whole thing went viral–I learned what it meant to have a piece of writing truly go public, and I had more emails and comments from readers than I could have ever imagined. I covered the story of a child behavioral therapist-turned-chef in a tiny hummus kiosk in Tel Aviv, and I wrote about impromptu New Orleans street music. I wrote about my usual suspects, too–odd and quirky objects, feminist approaches to travel writing, and I took a lot of pictures. In fact, at last count, I’ve taken over 10,000 this year alone (I know, I know, where am I going to put all those photos?!). I started doing more on social media, reaching out and commenting on other people’s work, and I went from 0 followers on Instagram at the beginning of the year to 3,000. My column in En Voyage magazine all the way over in Taiwan is still going strong, and I’m moving away from more advice-heavy pieces and branching out into more narrative memoir-driven pieces. I’m still writing creatively in those few spare moments. And, I just had a birthday, one that seems particularly odd because it doesn’t really mean anything except that I definitely can’t claim I’m still in my 20s and I can’t claim that I just turned 30. What happens, really, when someone turns 32? Or 33? Or onward from there? I don’t know what life has in store for me (I mean, who does?! ), but I know that I’m going to be facing some big decisions in the next year or two as I grace through the early part of this new decade: where (and if I want) to set roots, whether or not to have a family, how to finish my book, where to place my professional energies, my time, and my emotions, how to keep myself in balance mentally, spiritually, and physically, how to fit travel into my life in a way that doesn’t zap me of my passion but that keeps the little wanderlust who sits on my shoulder, like a tiny angel and devil wrapped into one, happy and playful. Though those questions are certainly for another time, here’s a metaphorical celebratory toast to the incredible people and places I met in nine very awesome places in 2015. In and amongst everything, I still found time to set my feet aloft, and here are just a few of the places they landed. My first trip of the year this year was to Vancouver, Canada, and let me tell you: What a gorgeous place to be in the wintertime. I had the wonderful pleasure of working with Tourism Victoria while I was there, and they kept me–and my writing fingers–very busy! I hopped a sea plane at dawn from Vancouver to Victoria (on Vancouver Island), and spent the day visiting the Royal B.C. Museum, where I arranged a private tour with a docent there so I could see two incredible artifacts: enormous Chinese freemason masks and one of the world’s only remaining tapa cloth books compiled by Captain Cook on his last voyage to the Pacific. From there, we walked over to the Grand Pacific Hotel and had a three-hour long West Coast high tea session. Before the sea plane took off for our sunset ride back to Vancouver, we took a quick jaunt to Victoria’s Chinatown and a lovely walk around some of the pretty tree-lined, European-style neighborhoods. I could absolutely see myself falling in love with Victoria and living here, very, very happily. 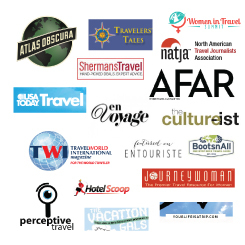 In March, I held my first creative workshop for professional travel bloggers at the 2nd annual Women in Travel Summit in Boston. It was the perfect city for a get-to-know-you networking event, as it was small enough to walk around with new friends and full of things to do. I’d never been to Boston before, and though I only had a little less than a week to explore it, what I found–quirky cafes, cobblestone alleys, tons of amazing Chinese dumpling shops, a million universities, and more Italian restaurants than I could count–filled my heart and spirit with joy. I even stayed with 5 women I’d never met before in one room filled with bunk beds at the super cool Hostelling International Boston. It was delightfully throwback to my years as a hostel-goer but trendy (and clean) enough to feel like a funky loft apartment. Totally a do-again. In May, I visited another American city that I’d never been to before: gritty, spunky, sweaty New Orleans. Two of our friends had decided on New Orleans for their destination wedding, so, as you can imagine, their entire day was completely destination-driven. From their sweet ceremony at the Irish Cultural Center to the mile-long second line parade down the streets of the French Quarter (led by, of course, a three-piece brass band and over 100 guests waving white handkerchiefs) to the shrimp and grits on the wedding menu and the reception in a loft-style warehouse, I felt completely and utterly taken by the city. As part of my ongoing work with the New Orleans CVB, Ryan and I stayed in a garret room–aka, a room with no windows–in the famous Degas House, where generations of artists and writers have come to find solitude and inspiration from the city. I loved it. The trees with huge swaths of moss hanging from them, as if suspended in time, the white wraparound porches, the humid, thick air, the delectable gumbo, the rebuilding and resistance of the city and its people in the wake of Katrina, the fact that so much of the city still needs care, the kind people with their particular New Orleans lilt, the musicians with their dreadlocks, mismatched clothes, coin buckets, and joyful faces….it all felt, so, surreal and yet entirely natural, like the whole history of one place was wrapped up in one moment, existing unilaterally. May held the magic of Russia. This trip was truly the trip of a lifetime, because 1) I was lucky enough to travel with Viking River Cruises on their Waterways of the Tsars outreach and 2) I got to take my mom, who, before May had never had a passport, with me. You really have to see St. Petersburg to understand its undeniable magic and its complicated history, and you’ll never meet prouder people. It’s a city of canals, of world-renowned art, of cafes and restaurants featuring global cuisine, of winding streets, of onion-domed cathedrals painted in brilliant candy colors, of street markets, a mishmash of Renaissance architecture, Communist-Era blocs, and modern Western-style apartments. It’s also a weirdly quiet city by day, making it perfect for leisurely strolls and long conversations over cappuccinos. Our three days here were three of the most unforgettable days I’ve ever had, as so much of what I thought about Russia got flipped upside-down, turned on its head, and refined. St. Petersburg reminded me why travel is so critical to our lives. In late spring of this year, I was invited to attend the Wild Horse Pass Resort and Spa’s grand re-opening of its restaurant, Ko’Sin. In the Pima language, which is the native language of the people who historically lived on the river here, ko’sin simply means kitchen. At the Ko’Sin restaurant inside the Sheraton Wild Horse Pass Resort & Spa just outside Phoenix, Arizona, where veh pug means beginning, hai chu hugimeans main course, and wamichtha means fry bread, food takes on whole new meanings here. As homage to the magnificent Sonoran desert landscape and the decadent restaurant menu, the Wild Horse resort is committed to local culture and preservation. Not only was the entire resort designed to be a place of honor and respect for the Gila River Indian heritage and culture, the architecture, design, art, and stories of the Akimel O’otham and Pee Posh tribes were celebrated in every detail imaginable, indoors and out. A small group of bloggers, writers, and PR people joined the culinary team and the rest of the Wild Horse Pass staff for a lovely night of sample dishes, marshmallows and singing by the fire, and a hauntingly stunning sunset over the Sierra Estrella Mountain Range. As we sat and talked to the flute player, a many-generations old member of the Pima tribe and a man who makes all his own instruments, I realized that in my seven years in Tucson, I’d never really given Phoenix a chance. I’m so glad I did. When people think of going to Mexico for holiday, most people don’t think of this tiny border town on the coast of the Sea of Cortez, just three hours from Tucson, but I’ll tell you something: I absolutely adore this dusty, abrasive, desert town. It’s sandy, relatively poor, and looks like it’s been sitting still since the 1990s when problems with the border halted nearly all construction, and yet, I love it. It’s unbelievably quiet, its beaches are long, wide, and flat, its water is clean and clear, and its downtown bustles with locals buying fruits and fish and tourists buying trinkets and souvenirs. There are some delicious restaurants, too, serving up all kinds of tamales, quesadillas, and, of course, Sonoran burros (our word for the burrito out here). Though we’ve been to this Arizona-dweller’s seaside paradise many times before, this summer’s trip was extra-special, because it would be the last time my friends and I would all drive down together before Ryan and I moved to California. The weekend held a kind of joyful magic in the air–we drank a ton of margaritas, we talked about our lives, our friendships, our writing, and our futures, we danced on the rooftop of our two-story Airbnb rental, overlooking the sea, and we cried. Against the sandy desert backdrop of modest Puerto Penasco, it was the most perfect weekend I could have imagined. The tequila-induced late-night dancing on the beach to 1990s hip hop music didn’t hurt, either. The one place I didn’t really travel to, so to speak. I’ve been living here since mid-August, after having taken a job just up the hill at a small college in Palos Verdes. Long Beach itself is equal parts the funkiness of Tucson with the elegance of L.A., so I’m still trying to figure out how I fit in here. I always dreamed of living the beach life, of waking up to sea smells and blustery breezes, of coming home with sandy feet and sun-kissed shoulders after a long day of paddleboarding, of hosting the many guests and friends who would come and stay with us. Things are, of course, a little bit different than that. I’m still getting used to the fact that houses are crammed together and that rent for a two-bedroom apartment is prohibitively expensive, that people don’t really ever say hello to me on the street and look at me in terror when I wave at them, and that our two cats Giuseppe and Luigi no longer have a yard to go out in during the long, lazy mornings. Of course, it’s stunningly beautiful here–the weather is magnificent, the beach is beautiful, the sunsets are lovely, and the restaurants, bars, and shops all walking distance from me are fantastic and represent all walks of life and cuisine from all over the world. We’ve hosted some dear friends and look forward to hosting more, and we take daily jogs on the beach. So far, Long Beach has been both kind and overwhelming, a study in contrasts. 2015 was the year I went to two of the most fascinating and complicated countries in the entire world. In October, I had the rare and incredible opportunity to visit Israel, the tiny sliver in the Middle East that seems to hold the history of the world in its small, oblong shape, along with tourism marketing organization Geoffrey Weill, the Israel Ministry of Tourism, and four other amazing bloggers and writers. We happened to go at a particularly difficult time: in the days leading up to our visit, headlines like “Is This the Third Intifada?” and “Tensions Mount in Jerusalem” captured the public’s attention and were the first hits on Google searches about Israel. The violence was real, and I went to this country in the thick of murders and heightened disagreements between the Israelis and Palestinians. And yet, in Jerusalem, I only felt a sense of serenity, a calmness that I can’t quite replicate, yet, in words, even knowing that just around the corner were violent acts, stabbings, and people afraid for what would come. Luckily, in December, we still aren’t facing another intifada yet, and one can only hope that the tensions don’t ever escalate that far again. One thing that’s particularly worth noting about this trip, more than the memories I have that will last me my lifetime, is that it was the first trip I’ve been on in which I completely filled up my notebook–every. single. page. Exploring ancient cities, unearthed cobblestone streets dating thousands of years, boats brought up out of the Sea of Galilee from Jesus’ time….Israel will upend you, make you question everything, make you understand the depth of the world’s monotheistic religions, make you fall in love, over and over again, with hummus. It’s all there. My hometown of Atlanta is definitely worth visiting, but what a lot of people don’t do when they come to my home state is drive up north to some of the adorable little towns near the foothills of the Appalachian Mountains. Dahlonega, a town of only 5,000 people with one of the cutest downtowns I’ve seen in small-town America and some of the best wineries in the Southeast, is one of these places. While my dear friend Magda, who I met in Malta nearly 11 years ago, was visiting me last week from Amsterdam, I decided to take her up there for the day to show her a bit of the south she hadn’t seen before. We ate a buffet of chicken-fried steak and collard greens at the Smith House, a historic house near downtown, shopped the cute little boutiques, stopped at The Crimson Moon and struck up a two-hour conversation with the two bartenders there, and tried a new recipe from Sweetwater, a local Atlanta brewery. We didn’t leave quietly, either: People were even waving to us as we pulled away in our quirky little rental car, an itty-bitty bright-red Chevrolet Spark. I’d say, all in all, I had a pretty lucky year. As always, life is complicated, full of the good, the bad, and either the things we don’t want to face or the things we’ve long ignored. Travel doesn’t relieve us of our troubles, cure our demons, or make our lives easier, but it has always helped me find perspective, and for that I’m eternally grateful. May 2016 be your year of light, with promises fulfilled, strength and patience to get through the difficult times, and lots of joy and beautiful travels!